Xiaomi announced a new series for the Redmi line last year – the Redmi S2 which was announced in May and was the first in the series. This phone was later launched in India as a rebranded Redmi Y2. The company is going to refresh this line this year with the new Redmi Y3 or probably as Redmi S3 in some global markets. 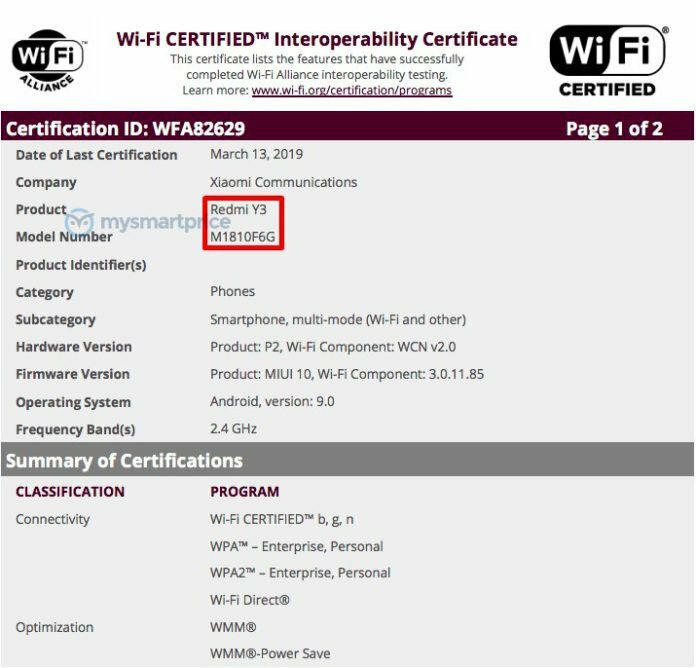 Redmi Y3 was discovered on the WI-Fi Alliance website last week after receiving a Wi-Fi certificate. The certification shows the model number of the phone as being at M1810F6G . It will work immediately with the Android 9 Pie and support Wi-Fi 2.4 GHz. The other features of the phone are not yet known. Redmi Y2 had a Snapdragon 625 processor, but we do not expect a Snapdragon 632 upgrade on the Redmi Y3 will be a smart move. We expect the Redmi Y3 to continue to be equipped with two cameras, such as it’s predecessor, a fingerprint reader for the back and hopefully a larger battery and an improved selfie camera. It should also have a lower price than Redmi Note 7 for INR 9,999 (~ $ 145).